It’s been a fun week, and I’ve seen lots of amazing bicycles. Perhaps both things go together. I had my good friend A and her friend D visiting. They both stayed at home and we went out on a Monday night. That night we also went to the casino. I saw it as a social experiment (and didn’t play, I’m sure my hand would tremble when betting a 5euro chip), but D won more than a 100 euro. My conclusions: apart from him and some other young guys there are mostly creepy old men. Although young men there were also quite creepy. And what did D do with the extra money? Well he invited us for lunch! And that’s when I saw this bicycle corpse lying on the floor in front Barcelona’s Gothic cathedral. On Saturday I went to Montcada i Reixac on the bicycle! I came across lots of real bike riders, you know, the ones that dress up in full gear…I have to admit I thought we would share some sort of human bond among us, so I was disappointed not to find it. Maybe they think of me as just an amateur, an ‘aficionado’ (that’s really the word I want). But anyways, I made it to Montcada through a bicycle lane that goes along the river Besòs. When it ended I had already been riding for more than an hour so I had to go back to Barcelona to return the two-hour gift I had rented. I was proud I made 30km in only two hours. I have no idea if this is actually fast or not. Nice bike! I suppose it was originally green, but it died and turned into yellow, no? RIP. but, on the other hand, the bike was seen lying in front of the Cathedral. Was it a penitent bike, hu?? What were its sin, btw??? That’s what I have every time I see one of these beauties! I wish I knew the answer to that…only the Gods know I guess. There’s only one thing I hate more than mountain bikes: folding bikes…something with soul can certainly not be folded away into pieces, right? I do agree. 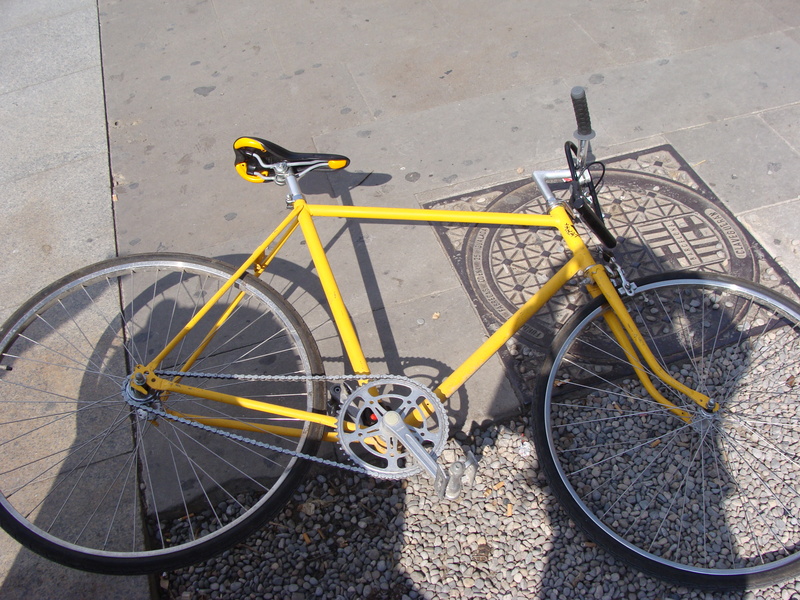 Bikes talk to us, complain, moan, cry, smile… Bikes lose weight, grow, have their lifes and, unfortunately, they die. And they are sometines kidnaped, but a ransom is seldom claimed. They are people like us. A bit rigid, ok, but people. I understand David Byrne…however, I would still never ever fall for the folding bike trap. I’d rather rent one, seriously. Seeing the tiny wheels and the high seat makes me shiver..
By the way, I haven’t any folding bikes XD. My only bikes are two beautiful Dutch bikes.